I’ve been listening to some new releases by d’incises, working in collaboration with various composers and musicians. (This is the guy who’s part of the Insub Meta Orchestra.) L’épaisseur innombrable is described as a “double bass solo by Félicie Bazelaire, based on a composition by d’incise”, which suggests a more esoteric process of transformation than a simple transcription or arrangement. (The packaging tells us nothing more than the above quote.) A thirty-six minute double-bass solo, L’épaisseur innombrable maintains a consistent level of activity throughout, inviting comparisons to Stefano Scodanibbio’s solo pieces or Hanne Darboven’s Opus 17a. Unlike these two examples, Bazelaire does not give us constant, motoric activity. Much of the piece maintains a steady alternation of long and short, like a heartbeat. On one level, it’s soothing; paying closer attention unmasks darker undercurrents, the alternating harmonies by turns wistful and portentous. Later, the pace broadens out further into sustained tones, a glacial rallentando. Bazelaire’s realisation of this piece creates the skeletal outline from some long-lost slow movement from the late romantic era. 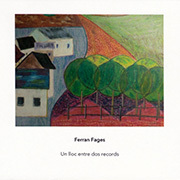 I got some exciting new releases from Another Timbre but I first have to give some time to Ferran Fages’ CD from the end of last year, Un lloc entre dos records. Fages plays his own composition for solo acoustic guitar and sine tones. It took me a while to come around to this one. I’ve heard a few great recordings in recent years by Cristián Alvear and Clara de Asís, playing severe, restrictive compositions for the guitar. Perhaps keeping those in mind a little too much made this piece seem to not quite gel for a while. Unlike, say, a piece by Alvin Lucier, guitar and sine tones are kept separate – no psychoacoustic trickery to enjoy here. After an opening section of widely spaced dissonances (semitones displaced across octaves à la late Feldman) a long passage of sustained sine tones reduces the harmonic and timbral palette to almost nothing. The guitar resumes, with strummed, dense, unresolved chords. The mind struggles to reconcile the parts into a whole. This piece is part of a trilogy exploring different guitar tunings, and Fages refers to Feldman in his other pieces in the series. Feldman worked in a subjective way that resisted an overall logic, but his audience has now become accustomed to his way of listening. Un lloc entre dos records suggests a new type of listening at play and, despite the Feldman references, Fages’ piece suddenly became more sympathetic when recognising the connections to the type of wandering aesthetic heard in some of Jürg Frey’s solo pieces such as guitarist, alone. Fages approach comes from the inside, as a guitarist, with a more forthright harmonic language made from the retuning of open strings. Almost ten years ago, I saw Alvin Lucier in one of the most memorable gigs I’ve been to, performing Bird and Person Dyning at Wilton’s Hall. It’s a magnificent piece in the way it leads the listener to consider the act of listening as an aesthetic act, the underlying phenomena and the consequences of this newfound awareness, all in one simple, seemingly effortless gesture. It’s this sort of thing that makes me consider Lucier one of the most important living composers. He was supposed to be back in London at the Round Chapel in Clapton last week, but had to cancel at late notice due to a health problem that prevented travel. The concert otherwise proceded as planned: a three-hour tour de force that affirmed Lucier’s presence as a composer of superb music. A couple of his classic/notorious works were presented in the second half, but the focus was on his newest music and was so much the better for it. The evening began with a recent work that signalled intent, Ricochet Lady from 2016: Trevor Saint on a glockenspiel off in a dark corner of the hall, hammering out rapid arpeggios in the highest register. The repeating figures created the psychoacoustic effect of sustained tones – the type that people who have heard early Philip Glass will immediately recognise – emphasised to the extent that the aural effects became the musical material instead of the notes played. A combination of the hall’s reverberation, the instrument’s bright timbre and the overtones of close-spaced high frequencies created a series of metallic buzzing and humming sounds beyond the physical scope of the instrument. Vespers and I Am Sitting In A Room were each performed live in the Round Chapel. Two of Lucier’s best-known works, each now fifty years old; both pieces still fascinate in the way they reveal fundamental qualities of aural perception taken for granted and complacently disregarded by musical theory. Hearing Vespers performed live reveals the spatial qualities of the sound, as the four blindfolded players traversed the hall by means of echo-location, while the electronic clicks they emitted were subtly transformed by their movements. This is minimal music, in a manner similar to that of a sculpture by Serra or Judd, exposing liminal phenomena of space, mass, sound or light through supposedly undifferentiated material. As with Cage, there’s often a didactic quality behind Lucier’s earlier music, those most famous (or notorious) pieces. A phenomenon is demonstrated. As with Cage, a superficial exposure to Lucier’s work suggests that he is more about ideas than music. The late works played at Round Chapel should go a long way to refuting this misapprehension. First and foremost, Lucier composes music – a point that his work has continued to make clearer and clearer over the years. While Vespers and I Am Sitting In A Room are “about” sound, Ricochet Lady is “about” music, treated and filtered without electronics. The ensemble pieces are all ostensibly “about” the same idea, but now this is obviously not the point. Like Cage’s music, the ideas serve merely as a means to an end. The ensemble is violins, cellos and saxophones, augmented on occasion by piano, vibraphone and e-bowed guitar. 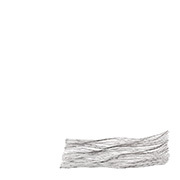 As played by the Ever Present Orchestra, when the winds and strings begin, the sounds combined with the sine tones are almost indistinguishable, producing a complex blend of tone that is hard to define. In Two Circles, Semicircle and Tilted Arc (a reference to a Serra’s destroyed public sculpture), the fundamental shapes suggested by the titles are perceptible in the trajectory of the music but subsumed within a broader, compositional form. Musical sense takes precedence over logical intelligibility. In Two Circles, a reduced ensemble of violin, cello, two saxophones and piano slowly interweave, their harmonies growing more distant, opening up into wider registers before resolving to a dense, multiphonic unison. Seimicircle mounts in a glorious ascent, brassier sounds to the fore, only to fall away again in a slow motion landslide. The grouping of instruments and electronics blend into a complex harmony and tonal colouration far removed from the usual stark palette expected from Lucier. This was felt most strongly in the world premiere of EPO-5, probably the high point of the evening. Using a large ensemble, the usual variations in harmonic intervals moved in ways that couldn’t be anticipated. For me at least, acoustic and electronic voices all seemed to move in different directions and any attempt to reduce the piece to a single concept was futile. It was simply music, lush and dramatic, intricate without becoming opaque, with strangely lingering effects that unfolded at a deliciously languorous pace. Listeners were carried along without feeling pushed. I can’t imagine hearing these pieces played better. The BBC were recording the event, so hopefully I get to hear it all again soon. Feels like I’ve been away forever. I got a bunch of new albums I want to talk about and a superb Alvin Lucier concert I went to last week, but right now I have to say something about this new release by Gil Sansón and Lance Austin Olsen. I got all excited about Olsen’s music last year, with his visual approach to making music. A real artist, y’know? He makes paintings, some of which function as musical scores, and takes a very collage-type approach to his recordings. On his Another Timbre CD last year, Olsen produced a multitracked realisation of a graphic score by the Venezuelan artist Gil Sansón. I’d described A Meditation on the History of Painting as “like painting, a synthesis of gesture and editing, with traces of the two processes preserved in the medium”. 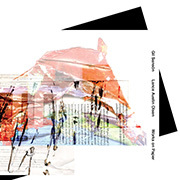 On this new album, Works on Paper, Olsen and Sansón give an extended presentation of their technique of creative exchange. Disc 1 features two realisations of Olsen’s painting/score Pra Mim, recorded by Sansón in Caracas. On the second disc the roles are reversed, with Olsen in Victoria, Canada recording two realisations of Sansón’s graphic score Meditations. For two hours, the air teems with tantalising connections, potentialities. As with painting, the fabric of the music hovers between fragments of narrative and unspecified affect. It’s an elusive music, part radio drama, part collage, part pure sound. The sense of meaning is always present, both in content and form, but is left to the listener to find for themselves. Sampled music, taken straight or manipulated, combine with field recordings, musical instruments, isolated phrases spoken or sung and mysterious electronic clicks and buzzes. Similarities between the two artists abound, inviting further connections and comparisons to be made between the two minds at work, one in British Columbia and the other in Venezuela. The sounds are captured beautifully. Within each realisation, certain elements repeat, or seem to. Everything becomes suspended in a dream-like state, fully aware but inexplicable. The pieces have been sequenced so that words, spoken or sung, appear less and less as time goes on. Pieces end on extended hiatus, with aural figuration giving way to empty spaces, alive with background sound. The final Meditation is wordless, with Olsen interpreting Sansón’s score with layers of sparse, amplified sounds and guitar. The album’s an ideal follow-up to last year’s Dark Heart release.